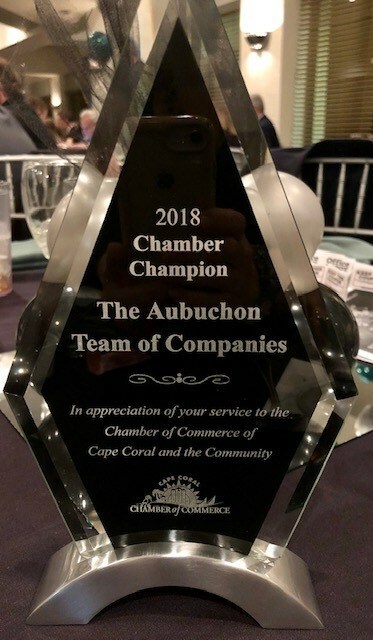 As a part of the Aubuchon Team of Companies, Miloff Aubuchon Realty Group is honored to be recognized with the 2018 Chamber Champion award. The award, presented by the Chamber of Commerce of Cape Coral during their installation Gala on January 25th, recognizes the Aubuchon Team of Companies contributions to the chamber. As the exclusive Music Sponsor for the Cape Coral Farmer’s Market, Miloff Aubuchon Realty Group has been supporting chamber events in Southwest Florida for more than 15 years.